Calendar of Acts passed this Session. ACTS passed in the Third Session of Parliament, holden and begun at Westm. the 4th Day of November, Anno Regni Regis Edwardi Sexti Tertio, and continued until the first Day of February, Anno dicti Regis Edwardi Sexti Quarto. 1. AN Act against fond and fantastical Prophecies. 2. An Act for the true making of Woollen Cloths. 3. An Act concerning the Release of the Branches in the last Act of Relief for the Payments of Sheep and Cloths, and also a Grant of a Subsidy to be paid in one Year. 4. An Act touching the Punishment of Vagabonds, and other idle Persons. 5. An Act against unlawful Hunting in any Park, Forest, Chace, or other enclosed Ground. 6. An Act for the Punishment of unlawful Assemblies, and rising of the King's Subjects. 7. 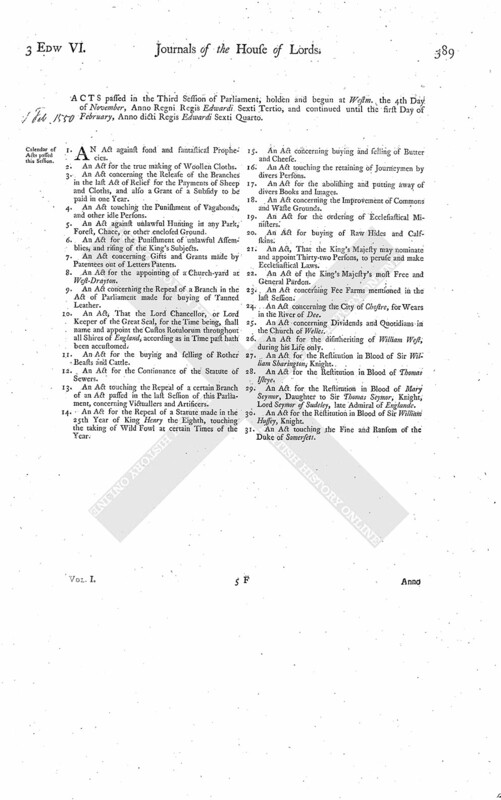 An Act concerning Gifts and Grants made by Patentees out of Letters Patents. 8. An Act for the appointing of a Church-yard at West-Drayton. 9. An Act concerning the Repeal of a Branch in the Act of Parliament made for buying of Tanned Leather. 10. An Act, That the Lord Chancellor, or Lord Keeper of the Great Seal, for the Time being, shall name and appoint the Custos Rotulorum throughout all Shires of England, according as in Time past hath been accustomed. 11. An Act for the buying and selling of Rother Beasts and Cattle. 12. An Act for the Continuance of the Statute of Sewers. 13. An Act touching the Repeal of a certain Branch of an Act passed in the last Session of this Parliament, concerning Victuallers and Artificers. 14. An Act for the Repeal of a Statute made in the 25th Year of King Henry the Eighth, touching the taking of Wild Fowl at certain Times of the Year. 15. An Act concerning buying and selling of Butter and Cheese. 16. An Act touching the retaining of Journeymen by divers Persons. 17. An Act for the abolishing and putting away of divers Books and Images. 18. An Act concerning the Improvement of Commons and Waste Grounds. 19. An Act for the ordering of Ecclesiastical Ministers. 20. An Act for buying of Raw Hides and Calfskins. 21. An Act, That the King's Majesty may nominate and appoint Thirty-two Persons, to peruse and make Ecclesiastical Laws. 22. An Act of the King's Majesty's most Free and General Pardon. 23. An Act concerning Fee Farms mentioned in the last Session. 24. An Act concerning the City of Chestre, for Wears in the River of Dee. 25. An Act concerning Dividends and Quotidians in the Church of Welles. 26. An Act for the disinheriting of William West, during his Life only. 27. An Act for the Restitution in Blood of Sir William Sharington, Knight. 28. An Act for the Restitution in Blood of Thomas Isleye. 29. An Act for the Restitution in Blood of Mary Seymor, Daughter to Sir Thomas Seymor, Knight, Lord Seymor of Sudeley, late Admiral of Englande. 30. An Act for the Restitution in Blood of Sir William Hussey, Knight. 31. An Act touching the Fine and Ransom of the Duke of Somersett.